How to make the web work for you - aimed at SMEs wishing to understand a little more about the web & how to make it work for them. Much like quite a few people no doubt, Xmas also always seems to mean that DIY items have been added to my Christmas list. This year its sanding and varnishing a floor. I think I'll be using Bona Traffic HD which I'll order from a local supplier. As you may recall, I've written several updates on the task of getting my client onto Google's first page for the term "skip hire leicester". For quite some time his site was 6th in the natural rankings, but because of Google Places, his listing was actually appearing on page 2. After some time and a number of content tweaks, his site is now appearing on page one of Google - his other site is now 4th in the local rankings as well. While this can be considered a relative success, his site is not number one! However, the difficulty that the local listings presented us is an increasingly common problem. Google is continuing to innovate with the first page rankings - to the extent that its rumoured that soon only 7 'natural' listings will be shown on page one. This means first page rankings will become even harder to secure. In response, many are looking to safeguard their position by using Google AdWords. However, alternative strategies are also emerging, with the focus more clearly on using social media sites (Twitter, Facebook, Pinterest, Tumblr, etc) as ways of gaining traffic. The viability of social media depends upon the nature of your target demographics, sector, etc. However, it's becoming increasingly clear that a Google only marketing strategy is increasingly risky. As well as building the Wordpress template for point of purchase designers Carter Design Group, I've also been tasked with improving their search engine ranking and overall conversion rate optimisation. The point of sale sector is hugely competitive. The search term 'point of sale design' has some 237 million results in Google. So, its a daunting task optimising for this particular sector. That said, at present Carter Design Group are fourth place on page 1 for this particular term on Google. For point of purchase designers they are #1 on Google! So, a very promising start to my search engine optimisation campaign for the Carter Design Group website. Leicester's leading independent waste management company, Bakers Waste Services, has expanded its skip hire service to neighbouring Northamptonshire with the acquisition of Bailey's skip hire. 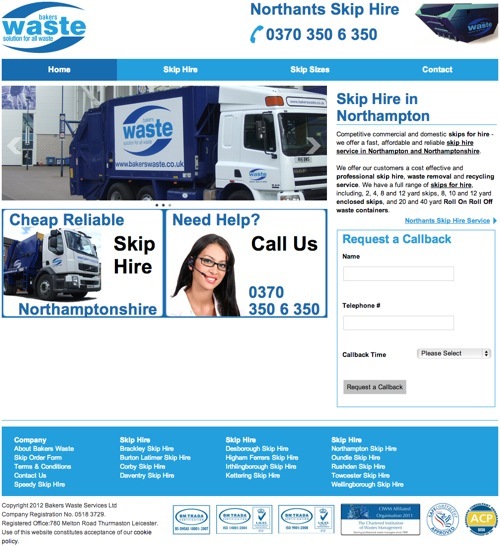 In line with the company's expansion into Northants, a new Northampton skip hire website has been launched. Designed by Fresh Web Services, this Joomla! website joins the wider stable of websites run by the company. Recently I had the pleasure of working on a Wordpress design for a Leicestershire point of sale designer. 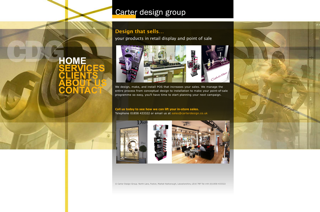 The Carter Design Group design, manufacture and install shop displays, counters, point of purchase furniture, etc for leading brands such as Dior, Estee Lauder, Sekonda, amongst many others. Carter Design in-house the entire point of sale design, build and installation process, having their own in-house team of designers, manufacture workshops and on-site installers. Having the teams in one location makes the Carter Design Group process incredibly responsive, especially during prototyping. Its a clear advantage over other POS designers, who outsource the build and installation. It also means that Carter Design are able to experiment more freely with materials and approaches than many of their competitors, while ensuring product compliance and trouble free installations. This seamless design to installation capability is just one of the reasons that Carter Design standout in the POS design industry. The quality of their work is another standout feature of the Carter Design Group. Why not visit their new website and see what excellent point of sale design looks like. Will Oracle Kill Off MySQL? Sometime ago I asked a number of questions about the implications of Oracle's acquisition of Sun Microsystems, the "owner" of the popular MySQL database and Java programming language. In particular I mused about the potential conflict of interest between Oracle's database and MySQL - the most popular database in the open source world. Would Oracle seek to downgrade MySQL as a potential rival or even allow it to wither on the vine? Why should you be worried? Because MySQL is the main database powering the vast majority of dynamic sites on the internet. MySQL is the 'M' in the LAMP hosting stack. Most open source projects such as Joomla, Magento, Drupal, Wordpress, etc, etc, use MySQL as their database. Most hosting companies provide MySQL support but few offer other databases. A closed source MySQL would be hugely disruptive. Well, Oracle's recent shenanigans of releasing MySQL bug fixes without test cases is causing renewed concern in the open source world. Without proper test cases developers cannot be sure that bug fixes actually work. This has the effect of removing transparency in the development and quality assurance processes - a key feature of open source software. If Oracle extends this attitude towards Java, then it's really troubling for a huge software ecosystems, not least Google's Android. The decision of Joomla's developers to include a PostgreSQL adapter seems like a sensible step and other open source projects are likewise exploring the option of enabling other databases. Its now for hosting companies to step up to the plate and begin offering reasonably priced PostreSQL hosting as an alternative LAMP stack. If you've been tasked with writing a web design brief for a new website, here's a web design brief template that might help you. It's based on experience and research, and is geared to the SME or SMB market website. You might find that it doesn't cover everything that you need to include in your own brief but it should be a good starting point. It's also worth remembering that the brief does require a good deal of thought - you should think carefully about what you want your website to achieve before you start writing your web design brief. You should also be honest about acknowledging the strengths and weaknesses of your existing website. Soon the bricks and mortar shop will double up as a warehouse for the online shop(s) as internet sales see a decisive shift to predominance. The high street is where the window shopping will occur while the transaction is done online. ... Their physical shops are now provisioning hubs for their online outlets, busy with actual shoppers only one or two days a week. This is now an emerging trend, with retailers offering "Click & Collect" points within existing stores, and some "thin" shops opening, where the shop is little more than a display window, and staff act as "consultants". The shop is effectively little more than a "click and collect" warehouse. The high street has been caught in the middle of a number of trends and policies that discriminated against traditional high street retailers. Planning policy, almost non existent regulatory controls on anti-competitive trading practices, & economies of scale favours the out of town hypermarkets, parking charges and congestion further undermine the town centre, while high rates discriminate against the small, "boutique" offerings that might make the high street an interesting "shopping destination". Most high street and town centre mall offerings are sterile, uniform experiences that are less and less appealing to consumers. One high street retailer that has done something interesting and successful is Apple. Their stores appear overrun with enthusiastic staff, who seem to be incentivised to help customers as well as sell stuff. Nor do they discriminate against customers who have bought an Apple product online or even second hand - once you own one of their products, you become part of the Apple "family". I recently took an iPhone I'd bought off eBay into an Apple store & a member of staff spent an hour resolving an issue I had - that's customer service normally restricted to in-store purchases (if you're lucky). It might be this kind of approach to retailing that helps to save the smaller type of high street retailer. The move to online "click and collect" is sold as customer convenience but its really about reducing costs via cutting stock and staff levels. The loss of customer service that this will entail is where the smaller retailers may be able to offer an "experience" advantage to their customers - that's if there's a high street left after this recession is over. UPDATE: Recent report on New Look says that 25% of their online sales are "Click & Collect", while they plan to reduce their shop portfolio by approximately 100 stores.